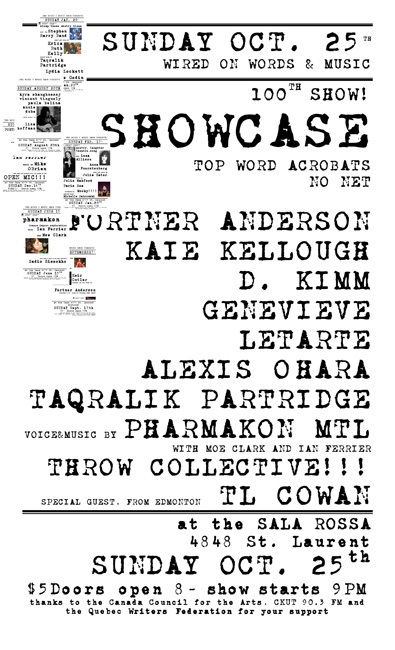 A project of poet/musician Ian Ferrier, The Words & Music Show grew out of the intense spoken word and poetry scene in Montreal, Canada at the turn of the millennium. It was part of a movement that wanted to place literature in the midst of popular culture, the culture one would expect at a lively performance venue on a weekend night. It also reflected a deep connection between the city’s poets and musicians, a connection that had already created the words & music label Wired on Words, and one that continues to spark collaborations between top musicians and poets in the Montreal scene. 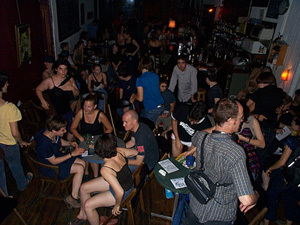 With the opening of the Casa del Popolo on the Main in 2000, the show officially began once a month, It featured top poets and spoken word artists from across Canada as well as excellent songs and music by some of the Mile End’s well-known and talented unknown performers. Structured to be lively, interesting, profound, entertaining and mesmerizing in turn, it has always featured short performances by poets, musicians, singer/songwriters, dancers, and sometimes even circus artists and comics. Rarely is a performer onstage for more than 20 minutes, and a typical set probably lasts 12. This means that even if you actively dislike one act, it’s quite possible the next will amaze you. It also makes use of the way words and music act on different parts of the brain. Before you’re tired of the imaginative landscapes of poetry, music is there to touch a different type of response. Because of the speed and structure of the spectacle, writers, performers and musicians all feel free to try their riskiest and most current work. As the idea took hold, it picked up interest from the Quebec Writers’ Federation and the Canada Council for the Arts, both of whom now sponsor the show. The show is also recorded and often rebroadcast on local radio station and sponsor CKUT 90.3FM. 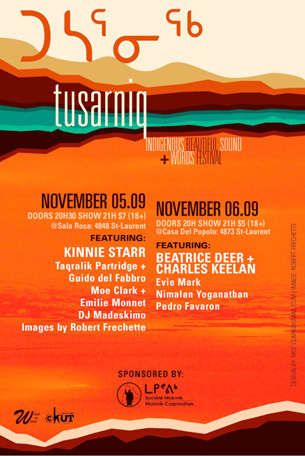 • the Tusarniq Festival—an Inuit-hosted Words and Music Show featuring First Nations poets and performers and their guests from the Montreal scene. 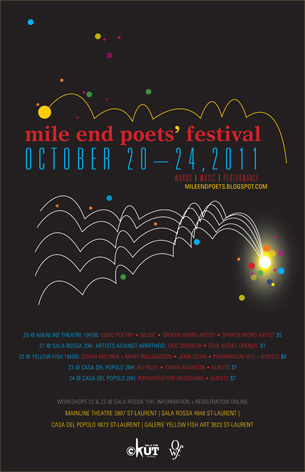 • the Mile-End Poets’ Festival—a 5-day words, music and dance festival featuring writers, poets, musicians and dancers who work in Montreal’s eclectic Mile End district as well as their guests from across Canada.